Shown with Included Cross Charm & Optional Pearl Charm. A popular and classic piece, this necklace is the perfect gift for such a significant occasion. Necklace set includes chain, heart pendant and lightweight cross (upgrade available.) Also includes FREE single side engraving, with the following options: engrave your child's name, initial, or even a fancy monogram on one side and a short message on the back. Her First Holy Communion will be remembered and cherished for years to come. Please note, all engraved items are not returnable and/or exchangeable. This professionally engraved necklace is stunning. 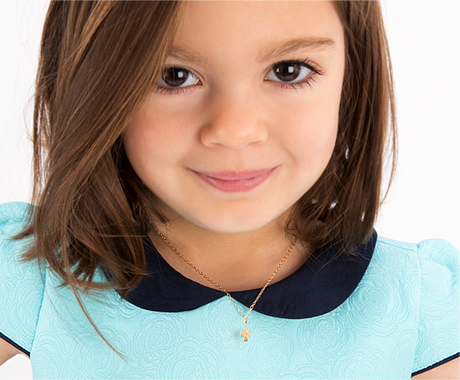 It includes one First Holy Communion religious charm, and has the option to personalize your gift by adding any of our gorgeous 14k gold charms.